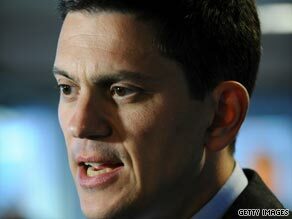 The remains of two bodies — possibly British hostages taken more than two years ago in Baghdad, Iraq — have been handed over to British authorities, British Foreign Secretary David Miliband said Saturday. “We know only that late last night we received the bodies of two hostages,” he said. He emphasized that British authorities had not yet identified the bodies but also said the country’s thoughts were with the families of five British men who were kidnapped in Baghdad in May 2007. “As would be the case with any development of this kind, they will fear the worst for their loved ones,” he said. Forensic examinations are underway, he said. The five men were kidnapped with two Iraqis on May 29, 2007, from an Iraqi finance ministry building in Baghdad. Miliband said that Friday’s development was “very distressing.” He called last month for the hostages’ release, saying a British team was working “tirelessly” with Iraqi authorities and coalition partners toward that goal. Four of the Britons worked for Canadian-based security firm GardaWorld, according to the company. They were protecting the fifth Briton, a computer analyst with U.S.-based BearingPoint. The only identified captive has been Peter Moore, who said his name in a video released by the kidnappers. The British Embassy in Baghdad received another video showing one of the hostages this March. The embassy released no details about the video, but the BBC said the hostage shown was Moore, who said the men were being treated well.